We believe in one God who exists in three distinct persons: Father, Son and Holy Spirit. We believe Jesus Christ is the Son of God who came to this earth as Savior of the world. We believe Jesus died on the cross and shed His blood for our sins. We believe that salvation is found by placing our faith in what Jesus did for us on the cross. We believe Jesus rose from the dead and is coming again. We believe the entire Bible is inspired by God, without error and the authority on which we base our faith, conduct and doctrine. We believe every believer should be in a growing relationship with Jesus by obeying God's Word, yielding to the Holy Spirit and by being conformed to the image of Christ. Gale LeGrand Williams is a native of Norfolk, Virginia. She is grateful for the opportunities that God provides her to glorify Him through the gifts and talents that He has given her for the uplifting and growth of His Kingdom. Gale is married to Ronald E. Williams, Sr. Esquire. Gale has three children, Kimberly, Claude and Ron Jr., and nine grandchildren Kiara, Taiya, Christian, Edward, Claude III, Camden, Colston, Chloe and Izayah. Bishop Gale Williams serves as Executive Administrator of the International Christian Ministries, Incorporated (ICM) Board of Directors in Richmond, Virginia and also serves on the New Jerusalem International Christian Ministries Board of Directors. She is a member of the Joint College of African American Pentecostal Bishops. Gale is also a member of First Mount Zion Baptist Church, Dumfries, Virginia where she serves as a Youth Servant Leader. 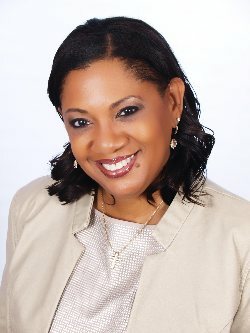 She is the President and CEO of Entrusted Connections, Incorporated an 8(a) business management consulting company founded in 2005 in Woodbridge, Virginia and she established Entrusted Connections Ministry in 2007. Entrusted Connections Ministry (ECM) does not operate out of a "traditional church building" and does not have a regularly scheduled assembling of people in one central location. ECM is an organization developed to support the community as well as educate, strengthen and encourage the Body of Christ through collaborative events and efforts. ECM sponsors a woman's retreat the first weekend of March each year in the Mid-Atlantic region of the United States. Gale is also the founder of God's Redeemed and Chosen Epistles (G.R.A.C.E.) Women's Fellowship and Bible Study in Woodbridge, VA.
Gale attended Delaware State College and majored in Business Administration and later received a Masters in Government Contracting from George Washington University. She was a 27 year dedicated civil servant in the United States Department of the Navy. During her career she was appointed to the United States Senate as a Legislative Fellow for Senator Carl Levin, and served as his personal staffer for Senate Hearings and other congressional sessions. She retired from federal service in February 2005. Gale received numerous awards and citations during her Naval career and received the prestigious Superior Civilian Service Award from the Department of the Navy upon retirement. Gale's desire is "to give back to God that which He has given to her." Gale is featured in the book "50 Phenomenal Black Women Over 50" by Connie Briscoe, 2008 and is the author of a daily devotional, "Lovingkindness in the Morning" which was released in February 2011.